Let introduce you in few words, how would you describe yourself ? Thomas Canto, 36 years old, artist. When did you first become interested in creating artworks ? Since forever, I’ve been sensitive to art thanks to my family. I have many memories from abstract works seen at museums and in books related to my childhood. What are few of your influences that occurs through your work ? Since forever and still today, I’m influenced by the world that surrounds me as I said previously. That’s it or to be specific, people from this world, who are my main influence. As a self-taught artist it took me a while to find out basis from my work. In my art, various abstract movements can be find through my work and mostly constructivism, optical art, futurism or yet rayonnism. Nevertheless, an expert gaze can also fin dynamism and balance research that I gained while doing graffiti, calligraphic art from its essence. You started through graffiti, can you tell us more about it ? As regards graffiti, my first memory, dates back when I was 10, when one of my secondary school classmate, way older than me showed me graffiti pictures and drawings from a notebook. These new shapes writing immediately appealed to me, make up with unexpected arrows and angles. I did some tags in school bathrooms as many other people at this time. Few years later, I had the opportunity to meet people doing graffiti in my district, I was already painting a little bit on my own and seeing big achievements, these colour explosions, this energy, in secret places ; I found a way to express myself. I think it’s a key moment for me. Nevertheless, I quickly found out that aerosol spray and the set format « lettering or figure » – which was the standard at this time – appears to limit my creation. I used different techniques and learnt art history in more detail thanks to an hard-working art teacher, I simply started to paint on canvas or on wood and mix all mediums and subjects that I knew in order to get different results from traditional graffiti but still, keeping elements that had my interest in this media. Music appears as a huge part into the graffiti culture, is it true for you ? Of course there is a link to music through my work. The « rhythmic » aspect that occurs in my graphic design brings up repetitive and industrial sounds. It’s a connection that arise my interest and I started to work on it, especially for the installation « Still life of space time », on show at the Wunderkammern Gallery in Roma . This work mixed light, sound, sculpture and this experience inspired me so much. I read that your work was bound to urban architecture, can you tell us more about it ? Architecture as environment is one my main inspiration. It’s a an artistic subject which tells Mankind History. Each building is a work which tells a different story and each city shows people story who lives in and build it. This taste for architecture dates back to my childhood with the discovery of Christo work and especially the Pont Neuf work. But I think this increased when I did graffiti and I spent my days in empty industrial spaces. These monumental architectures without any life, in which nature takes over step by step reminds me to an intense industrial past that ended. Also, geometry and straight lines are obvious through your work, how do you want it to affect the viewer’s gaze ? The geometric aspect of my shapes occurred quickly through my works. Step by step I worked on style without making subjects any simple as I did in my paintings. Increasingly, strongest lines and perspectives became the main elements in my works. This far that I started to put them outside my work in three dimensions. In order to show the confusion created by the contemplation of an intense urban architectural complex. First time I saw your work it was Inside a plexiglass box, does it appear as a window? I always thought that my work, since I put them on display like this, are windows on other worlds. The use of plexiglas let me add meaning to my works. The thickness and the depth of my works allude to the monolithic side that occurs if one look at most of buildings and the transparent aspect of acrylic glass alludes exactly to the idea of a window, a pathway to another world. Also a big part of your work is all in black and white, why ? With regard to the omnipresence of black and white through my work, this is related to the fact that I deal with architecture and often buildings are in these tones. The significance that I give to the balance research also plays in my choice to work only with these tones. Finally I think black and white give a technical and industrial aspect to my works. Why introduce colours then ? I only painted in black and white for a long time, for reasons previously mentioned. Lately, I started again to add color to my works. It’s reflect the fact that for many years, I worked according to pictures, most of the time in black and white from architectural landscapes that I shot while travelling. Step by step I started from my memories and naturally the longing to add colour shows up. It let me share a feeling, a specific moment experienced. You also turned your work into installations, increasing its size. Does Physical presence appear important in your work ? When I started creating installations surrounding entire spaces, it was the idea to project the viewer in the middle of my pictorial universe, into my reality. By the way, titles from my first installations were « Gravity B » or « An other gravity ». With time, the more I designed new installations, the more I added elements from my urban observations, as overlaid elements which create optical illusion. Also I got closer works where the main part was the viewer. Because in the end, it’s when the audience moves through one of my installation that it reveals all its meanings and hidden detail. 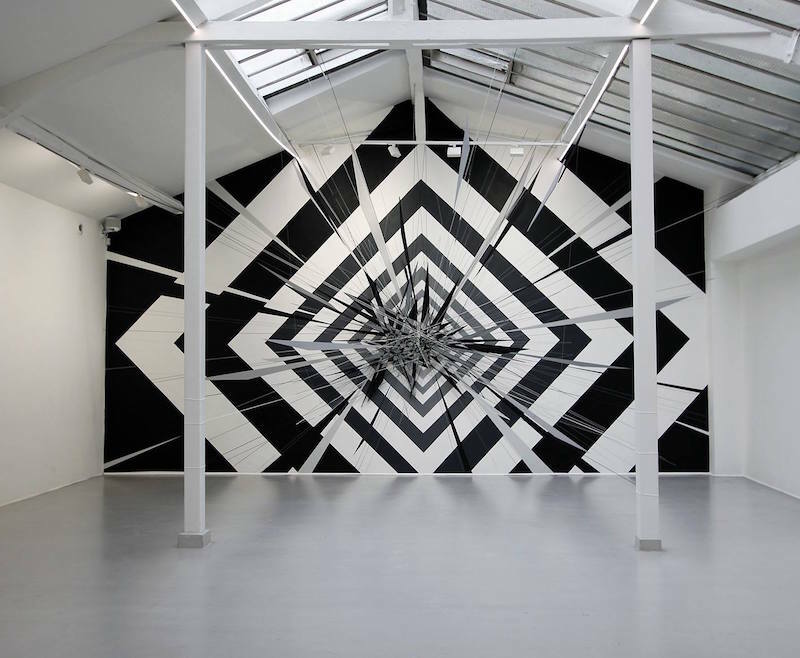 Is Optical illusion in your work relates to the architecture feeling ? Actually, I added optical illusion to my works in order to create a feeling of confusion and the loss of landmarks produced by some buildings. A little bit like the vertigo feeling that occurs when one look from the top of a skyscraper while standing at the base. In one sentence can you describe what you are trying to achieve visually and intellectually with your Works ? Any dream place where you would like to see your art on display ? I think that the best place for one of my installation is just the street. A place where the link between my work and the environment where it should be on display is obvious. But also the ability to share with a larger public without discrimination.